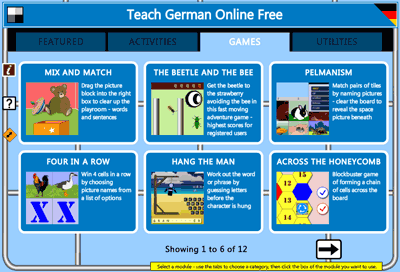 When you start Teach German you begin by selecting a topic - this can either be a primary / elementary topic with 10 items of language, or a secondary / intermediate topic with 20 items of language. Having selected your topic, you must select a first teaching module - either an activity, a game, or, in preparation, a utility. Language in Teach German is organised into topics which are sets of related items, each consisting of a picture, a text and an audio recording. Primary topics have 10 items each, and are grouped thematically. Secondary topics have 20 items each, and are ordered alphabetically. On the topic selection page, you can choose to view the primary topics or the secondary topics. To switch between them, click on the arrow button at the base of the large red sign on the left. Having selected your level, you can view topics available by Category, or by whether the topic consists of single words or whole sentences. Click on one of the arrow signs to narrow down the range of topics, then click on a named topic to select it. The topic will load. Roll over the topic pictures to preview the audio for that topic. 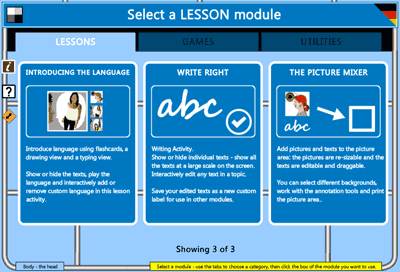 Choose to select either a lesson module or a game module to proceed to the next screen. 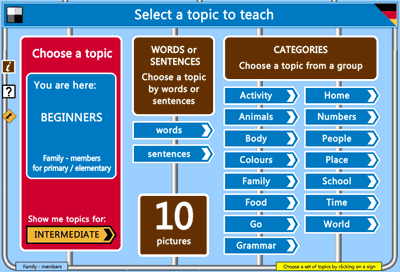 Having selected a topic, you can now select your first teaching module. Subsequent modules are selected using a menu bar at the top of the playing area. These are your core teaching tools - for introducing language, for revising language, for spelling, and for a little fun too! The 12 whole class games are intended to reinforce the language you have introduced previously using the teaching activities. Preparation modules for you the teacher - to familiarize yourself with topics and any custom labels that may be available for a topic. When you click on any module, that module will load and you will be taken to the settings page for that module.